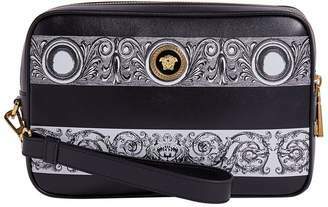 Overview Updating the label's archive Barocco print, this Versace clutch is imagined in a monochrome design that is punctuated with the iconic Medusa motif in a gold-tone plaque. Rendered from sumptuously smooth leather, the slimline profile boasts a detachable wrist strap, offering the perfect addition to accessory portfolios. H16cm x W25cm x D5cm approx.